So after another promotion, I was leading Almere into their first Eredivisie campaign. Our KNVB Cup win also bought Europa League football to the Mitsubishi Forklift Stadium. 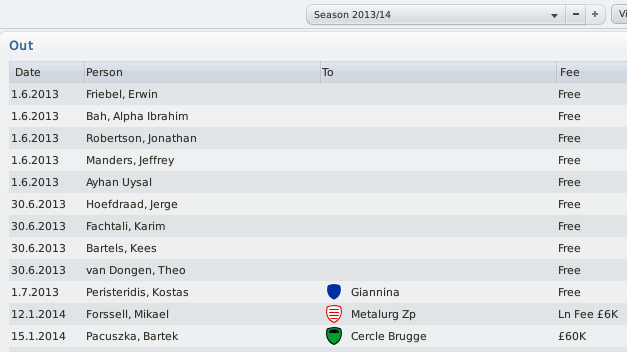 The 2–3–2–3 formation did not work as well in my last top tier campaign with FC Zwolle. FC Zwolle, did however, still end up relegated that season. 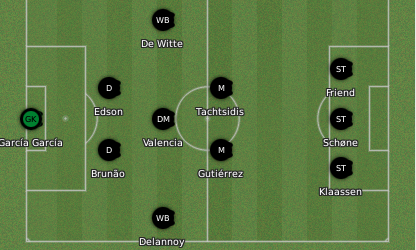 Thus, I was adamant to stick to the formation for 2013–14. The key was to sign players with the formation in mind. I did, though it needed some tinking around in January and players needed time to gel. First in were former signings Joel Veltman and Felix Kroos — two former loanees who played key parts in the promotion season — both on free transfers. Veltman would have a tough start before adjusting to the higher standard of competition. Kroos, however, would struggle to step up to the higher division and fail to register a goal all season. Davy Klaassen, now 20, had struggle in two seasons on loan at Vittese Arnhem at Huddersfield Town. 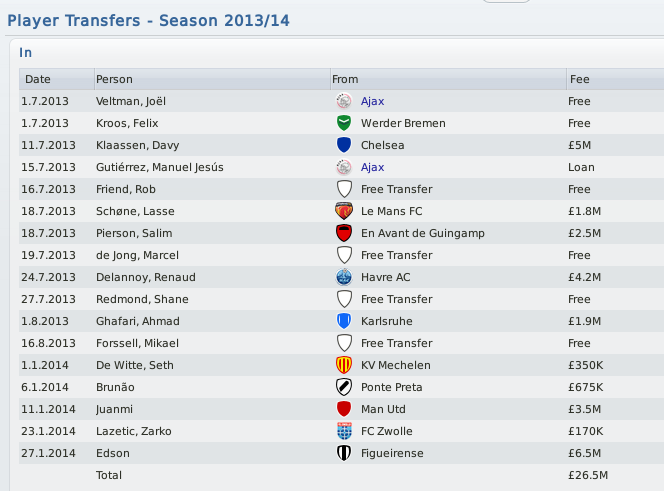 As he’d performed well during my first season at Zwolle, we played a record £5,000,000 sum on him. Despite struggling early doors, Klaassen would have a strong end to the season and be nominated for the division’s young player of the year. Manuel Jesus Gutierrez, young Spanish midfielder, joined on loan from AFC Ajax, as part of the affiliation between the clubs. Not a regular at the beginning, he grew into a midfield role and was the first name on the team-sheet for much of the season. Also nominated for young player of the year. Experienced heads Rob Friend and Lasse Schone also arrived. Friend, in his thirties had been released by Hertha Berlin. He was banging them in for Canada all season but often struggled for fitness and form, made it up for it be being unplayable in the final run in. Schone, had struggled for games at Le Mans but came in and was largely inconsistent, despite being the most talented player in the squad. Guingamp’s Salim Pierson, a 17 year old full back also arrived. Pierson was one of a number of youthful players signed due to the high tempo of the club’s style of play. Looked promising, but tended to get overawed. Marcel de Jong, arrived on a free too after struggling at Manisaspor, the wing-back would predominately make substitute appearances and made some key contributions but was sub-par whenever he started. Having already played and scored for Le Havre’s first team at 16, Renaud Delannoy, was another young prospect bought in. He would perform best out of the club’s teenagers, able to play at right back and in the middle of the park, he is easily better than van der Wal, already. Though, he was one of a number to suffer from a long term injury. Irish keeper Shane Redmond joined on a free following his release from Chesterfield, but would fail to make a first team appearance. Angel Garcia Garcia would play every game that season for the club, being nominated for the young player of the year award and keeping 11 clean sheets. Young German midfielder Ahmad Ghafari, of Iranian descent would also come in. Ghafari would play just four times for the club, and look underwhelming each time, though is still still a good prospect. Mikael Forssell, Finnish legend, joined on a free following his release from Hannover, despite starting well, the former Chelsea and Birmingham man would look rather poor as the season went on. The summer would also have seen the arrival of Haris Seferovic but due to the reset date for Netherlands being quite late, the budget to bring him in was not available and the Swiss striker signed for Shakhter Donetsk. Man City’s John Guiddeti rejected the chance to join Almere on a permanent to join Bristol City on loan whilst Reim’s Pontus Wernbloom opted to stay in France with Saint-Etienne. January saw the arrival of Seth de Whitte. The Belgian wing-back slotted seamlessly into the left hand side and performed admirably and was a big part of an upturn in fortunes. Brazilian defenders Brunao and Edson were both influential, too. The side had been leaking goals, not due to poor defending but due to losing the ball high up the pitch due to style of play and not having quick enough defenders to make up for it. Despite both ending up with long term injuries, they helped shore up the defence and their influence was vital. Man Utd’s former Malaga man Juanmi signed for £3,500,000. A serious injury on his debut, but he returned to smash four past Utrecht. He ended the season with five goals in four matches. Zarko Lazetic joined me once more from Zwolle. Available for a cut price free of just £170,000 due to his contract expiring, the 32 year old Zwolle captain filled in a gap in our first team and weakened our relegation rivals. Friedel, Bah, Robertson, Manders, Ayhan, Hoefdraad, Fachtali, Bartels and van Dongen were all adjudged to no longer be good enough for Zwolle. Peristeridis agreed a deal with Giannina before I could decide whether to offer him a new contract. Needing more options up front, I determined that in order to balance the squad and wages, I needed to get rid of either Forssell or Friend. Forssell hadn’t performed slightly worse and thus joined Metalurg Zaporizhzhya on loan, we scored three times in six games. Pacuszka’s performances had been underwhelming and with de Whitte now available as well as Pierson looking good, he was offloaded for a reasonable fee of £60,000 to Cercle Brugge. Edwin van Weert, the young prodigy despite struggling for fitness and form, was being courted by Liverpool, AC Milan and Man Utd but the club stood firm and he stayed. A lot of positive results. No real issues. Despite battling hard, the superior movement and speed of Ajax proved too much and they ran up a flattering 6–0 scoreline. The issue with this tactic is if you lose you get demolished. Thankfully, this Dutch version of the Community Shield isn’t a big deal. The pace issues at the back became evident quite early on. We were in both games against Groningen and Ajax but ultimately the pace killed us at the back. The next three games were the most promising. A Rob Friend double secured a smashing victory in The Hague wheras VV Venlo and NAC Breda were held out home. Our morale then was shot with a run of defeats with performances getting progressively worse. Davy Klaassen finally scored his first league goal against Roda JC and scored three in the following three including the opener in a vital 2–1 victory over RKC. We then had to wait over two months for our next win. With Brunao finally making his debut, a fantastic defensive performance lead by Joel Veltman kept the Champions League contenders at bay. Veltman would score the winner with a diving header on 80 minutes and Klaassen and Kroos went close to adding a second late on. The fine defensive performance continued against Ajax, going forward the side looked threatening but Klaassen missed three sitters at his former club. Late on, Veltman found himself 1v2 and bought a tactical foul, Majid Bougherra scored from the resulting free-kick. Edson meanwhile scored twice on his home debut as we completed a double over ADO Den Haag. After a miraculous home draw against Feyenoord, a defeat to Heerenveen meant it was rather interesting with nine games left. We won nine of our last nine, keeping seven clean sheets in the process. On the way, we were praised for our style of play. We lost a lot of players in this spell due to injuries and suspensions but replacements were able to slot right in. It all started with a Rob Friend double in Arnhem. Friend was joined by Lazetic on the score sheet as Roda were defeated 2–0 by the same scoreline. Lazetic scored the winner in a backs to the wall win over AZ. Before a Klaassen double overcame NEC at a full crowd. RKC were defeated for the second time that season as Friend popped up again. He also scored the winner in another tight match against Heracles, before the side turned on the style in the last three matches. The returning Juanmi scored four goals and played a beautiful assist for Klaassen as Utrecht found themselves 5–1 down at home, at half-time. They pushed to get back in and score two second half goals but the job had been completed in the first half. Juanmi then joined Friend on the scoresheet as PSV were steamrolled in their home park, with Schone dominating the game from midfield. A Lazetic hat-trick, as well as two Bruinier own goals and another Rob Friend striker overcame Zwolle 6–0 on the last day for the biggest win of the season. The introduction of de Witte, Edson and Brunao had helped the team settle, as well as a sudden return to form from Friend, Klaasen, Veltman and the introduction of Lazetic, in the end they team stayed comfortably up, finishing 11th. Despite being expected to struggle, the club finished 16 points above the drop zone. The first European tie in the club’s history was a narrow defeat to Swiss club Luzern. Tachtisidis scored the opener and Almere looked to have just edged the tie, despite Rob Friend’s red card, before Falvio and Gygax both scored in the last five minutes. Despite Kalbermatten’s opener, Luzern were on the back foot all game and failed to get another shot on target. Either side of half time, two fine poaching strikes from Klaassen gave the side the lead on the night, before de Jong’s late drive from outside the area won the tie. The side were drawn in Group A with Sparta Prague, Sporting Club de Portugal and Standard Liege. The group began in some style with a thumping victory over Sprata. Tachtsidis and Forssell both score early penalties to give the side a two goal lead. Forssell then scored a second after fine link up play with Klaassen having also hit the bar and had a chip land on the roof of the net. Ygor pulled one back for the Czech side early in the second half, but Frank der Zwan’s only goal of the season after brilliant work from Yassine Halim to win the ball and provide a perfect cross and a Renee Troost diving header gave Almere a 5–1 victory. The side’s inexperience and lack of quality began to show against both Standard and Sporting. In the latter game, however there were two goals of real quality. First, Yannick Djallo scored a fine volley, and then straight from kick-off, a fine passing move saw Balasz Toth fire a smashing drive into the far corner, easily Almere’s goal of the season. In the return game, Djallo again scored twice as Sporting had more of the ball, still we look good going forward and took our chances with a Gutierrez’s first professional goals and a Tachtsidis strike giving us a historic 3–2 victory. Defeat in Prague was flattering to us, we lost 1–0 but it really could’ve been more. We still had a chance of knockout qualification going into the last game, but after looking good, Christian Benteke gave his side the lead on the stroke of half time and the side collapsed. Still, the team was competitive and gave two historic victories. Nothing remotely significant happened in the side’s unsuccessful defence of the KNVB Cup. Davy Klaassen’s double saw past FC Den Bosh before Veltman scored twice and Troost the other as lowly Papendrecht showed they couldn’t defend set plays. VV Venlo ended the campaign in early December in a tight game with little quality. It looked tight for large parts of the season, but eventually the quality of the side shone through, with some amazing results. The challenge next season is to consolidate the spot in top tier as well as adding some quality to replace the departing Gutierrez and replacing some aging legs.